The At-A-Glance signature collection monthly desk pad features a clean, modern design with gray and Red print on each page and a textured gray top binding with brass grommets for added style. Its date range covers 12 months from January - December for complete planning all year long. The one month per page format features spacious unruled daily blocks for open scheduling of events and deadlines. Each daily block provides ample writing space. Weeks run Sunday - Saturday. A full year calendar reference is listed across the bottom of every page with the current month indicated for easy future planning. Pages also include a ruled notes column to write monthly reminders and tasks. The wide top binding with two grommets allows desk pad to be hung as a wall calendar. Two clear Poly corners keep pages flat while on desk or wall. A durable backboard provides a sturdy writing surface. 22" x 17" size offers plenty of planning space while also protecting your desktop. 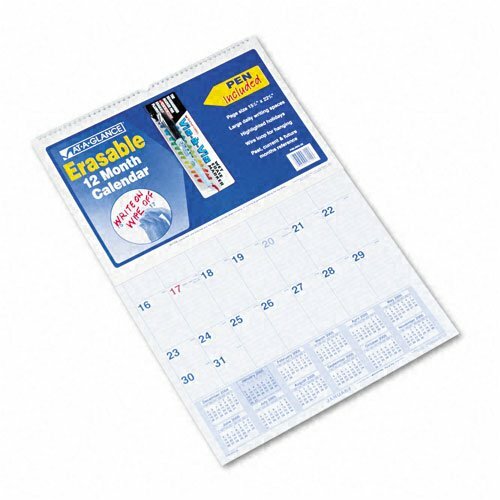 Laminated wall calendar lets you easily rewrite schedules and change appointments on the erasable surface. 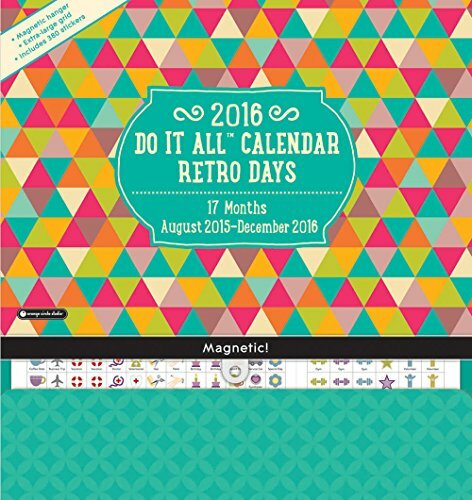 Calendar includes six double-sided sheets with a one-page-per-month format on both sides. Each page includes daily ruled blocks (1-9/16"" x 2-7/16""), Sunday-through-Saturday scheduling, count of days/days remaining, holidays, and a full-year calendar reference. Dated planning pages range 12 months from January to December. 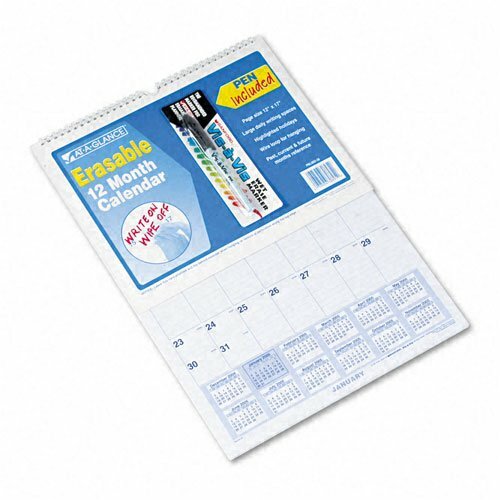 Calendar includes a wet-erase marker. Hang calendar easily on a wall with the included hanging loop on the top wire binding. When your upcoming events are visible at a glance and your loose ends are all in one place, staying organized is simple! Even if you're not an avid planner, Orange Circle's Do It All Mom calendar allows you to stay on track with minimal effort which helps families to communicate better, plan better and find more time to spend together! With everything in one spot, Mom and the whole family can plan birthday parties, school events, games, lessons, family events and more. The Do It All calendar measures 12 x 25.75 inches when opened, spans a full 17 months; Aug. 2015 - Dec. 2016 and has extra-large grids with plenty of room to write. A handy large pocket stores notes coupons, and receipts and there's over 300 stickers to mark appointments, birthdays, trips and more. 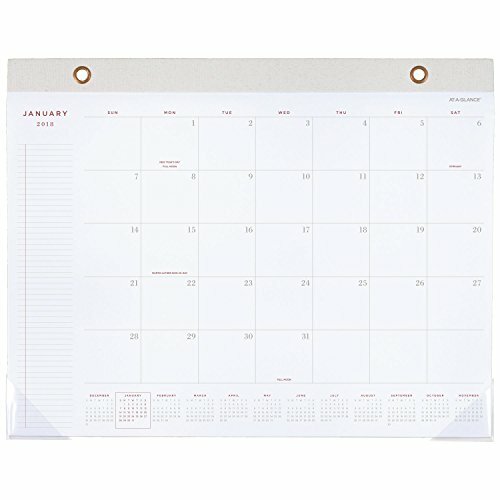 Plus, its magnetic hanger with a unique holder allows the calendar to be used on the fridge or on the wall, and allows pages to slide in and stay flat. A clever fold-out wing enables you to write family names only once for the entire 17 months - WOO-HOO! 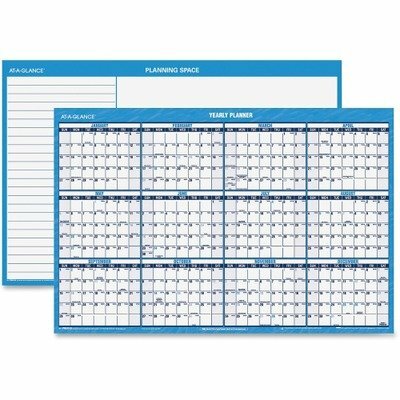 At-A-Glance Products - Erasable Wall Calendar, Horrid., Jan-Dec, 2-Sided, 36amp;quot;x24amp;quot;, Blue - Sold as 1 EA - Erasable Horizontal Wall Planner is ideal for planning office meetings and events. One side has one year of dated planning from January to December, and the other side has a notes and planning section. Both sides are dated. Thick laminated write-on, wipe-off surface allows easy changes and ample writing space in each block. Wall planner includes water-soluble marker. Large bold print on bright white background is easy to see and read. Stay on track with yearly calendar on one side. Write-on, wipe-off surface erases easily with a damp cloth. Shaded weekends contrast with the workweek. Wet erase marker included. 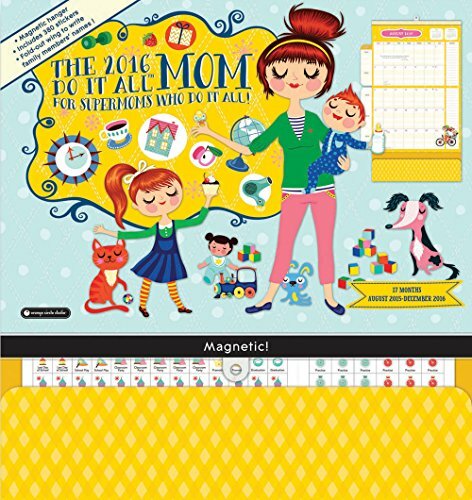 Size: 36 x 24 Page Color/Theme: Blue/White Edition Year: 2015 Calendar Term: 12-Month Jan.-Dec.. Choose red on one side or blue on reverse to complement office dcor. Block format is ideal for planning monthly projects. Laminated surface wipes clean with a damp cloth. 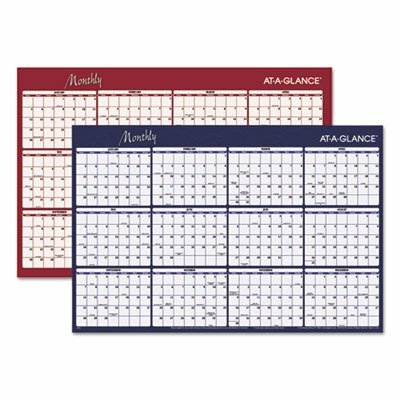 Size: 48 x 32 Page Color/Theme: Burgundy/Blue Edition Year: 2015 Calendar Term: 12-Month Jan.-Dec..
More Time Moms - 2018 Family Organizer Wall Calendar. 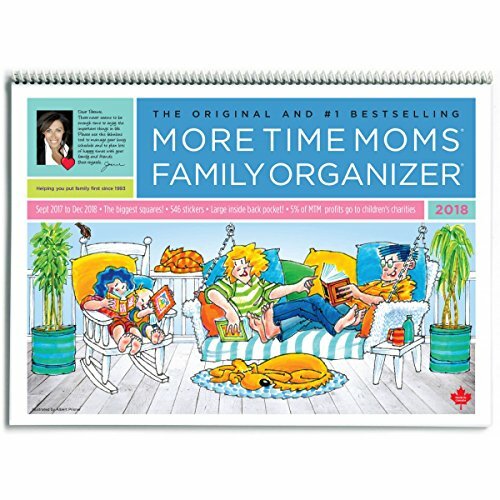 Now in its 23rd Edition, the 2018 Family Organizer Wall Calendar by More Time Moms is the original, best-selling family planner for over 20 years. Never forget an appointment, school play, soccer practice, or family vacation again. Featuring large 2.1" x 3.5" squares allotting for plenty of room to record all of life's little (and big!) moments. 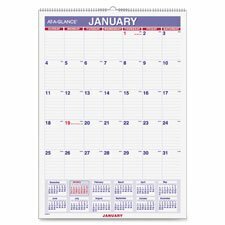 This calendar is spiral bound and opens up to 15" x 22", so there is more than enough space to write on high quality opaque erasable paper. Includes 189 star stickers to track chores and rewards, and 357 appointment and reminder stickers so your family can keep organized at a glance. Also includes monthly a message and challenge board, telephone, emergency, and medical directory, recipes, to do lists, kid's chores, inspirational quotes, and moon phases! An extra large pocket is included to help keep track of bills and loose paper. There are even coloring pages for kids to color! This calendar spans 16 months: September 2017-December 2018. Appointments, dates, travel, work, parties - you're always on the go and you've got to keep it all together. Orange Circle's Do It All calendar organizes everything in one spot and helps to keep life exciting and fun! It's loaded with organizing extras that planners everywhere will appreciate, and its charming artwork each month will keep spirits high. The Do It All calendar measures 12 x 25.75 inches when opened, spans a full 17 months; Aug. 2015 - Dec. 2016 and has extra-large grids with plenty of room to write. A handy large pocket stores notes, coupons and receipts and there're plenty of stickers to mark appointments, birthdays, trips and more. Plus, its magnetic hanger tab makes it easy to put the calendar on the fridge or hang it on the wall, and a unique page holder allows pages to slide in and stay flat. Had Goldilocks been weighing the pros and cons of planners instead of porridge she certainly would have been delighted to find Orange Circle's just right monthly planner because, after all, it's "just right." 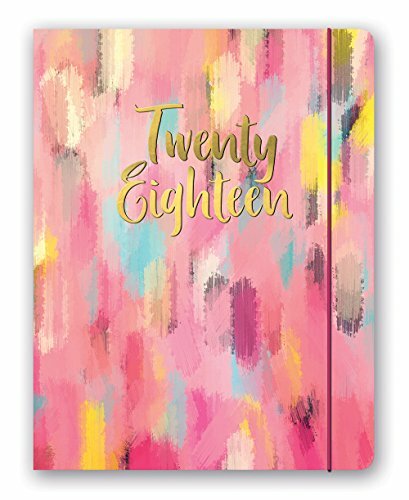 the just right monthly planner measures 7.5 x 9.75 inches - it's the perfect size for organizing your day and keeping track of future events without taking up too much space in your purse, briefcase, backpack or on your desk. Plus, it spans a full 17 months (August 2017 through December 2018), features full color month-per-spread views and includes a lined and perforated "notes" section on each page so that you can make lists and take them with you as you head out the door. There's even a handy storage pocket for loose papers, receipts or whatever strikes your fancy. The just right planner is printed in full color throughout and even has a color-coordinated elastic band closure. WOW it really is "just right." Orange Circle is a publishing company that puts thought, passion and incredible energy into every product is creates. They invite you to explore their ever-expanding line of fresh, innovative calendars, organizers and planners available on Amazon.